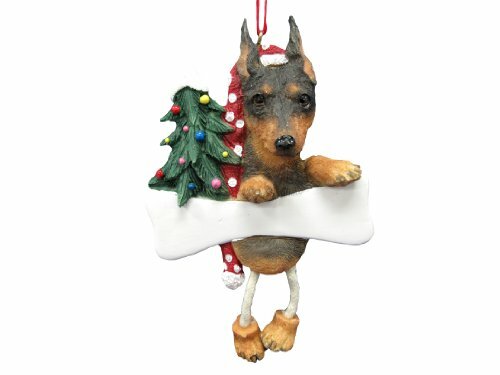 Bring a little playfulness to your home this year and for years to come with these adorable Miniature Pinscher Dangling Leg Ornaments. Each ornament is 5 inches tall and 3.5 inches wide, making it a perfect fit to any tree. Your Miniature Pinscher is featured next to a decorated Christmas tree, in his or her Santa hat, holding onto a bone with its adorable puppy feet dangling underneath. The bone is easily personalized with a sharpie so you can add your Miniature Pinschers name, the year or whatever you desire to give it that personal touch. This is a fun unique ornament and it is sure to catch eyes. 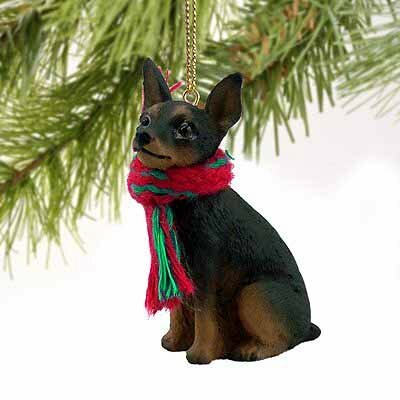 Each ornament is hand painted with the most realistic detailing to every key feature of the Miniature Pinscher. 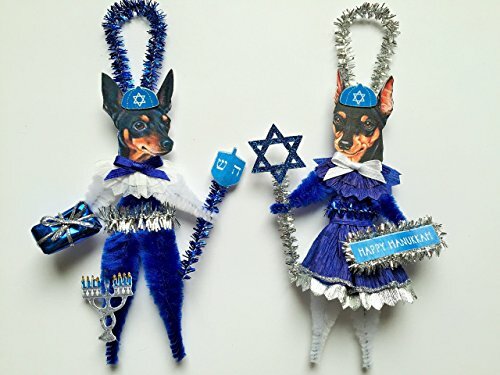 These ornaments are very artistic and particular attention was paid to capturing the unique shades of the Miniature Pinschers fur and facial features. Every Dangling Leg ornament was hand crafted with poly resin to ensure the durability of a great appearance and a wonderful holiday keepsake for years to come. 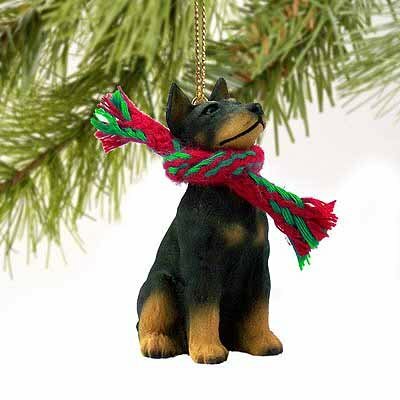 This is sure to be one of the most adorable items this holiday season whether it is for you or as a gift idea for a Miniature Pinscher lover you know! 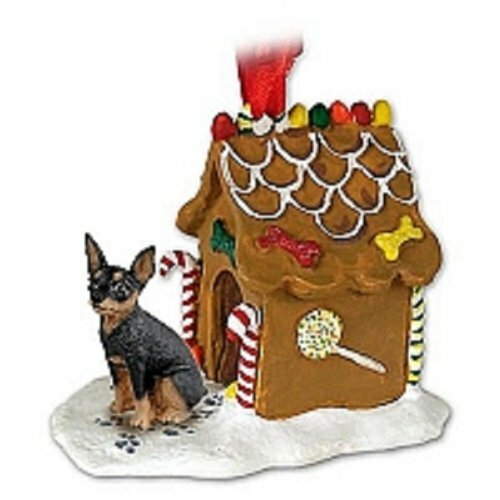 Miniature Pinscher Dogs Gingerbread House Christmas Holiday Ornament. These lovely holiday ornaments are made of hand-painted stone resin. Each ornament measures approx 3 x 3 inches, and make great gifts for the dog lover in your life! Introducing this year's trendiest Christmas ball ornaments! 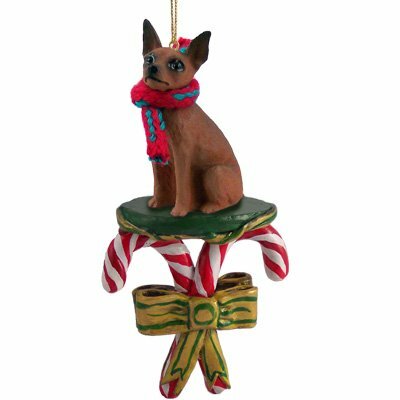 These Miniature Pinscher ornaments are measuring 3 inches in diameter and come equipped with the most convenient feature: they're SHATTER PROOF! If your furry friend decides to climb the tree or runs past it a little too quickly, don't worry; these ornaments won't break into little pieces all over your floor like other ball ornaments would. 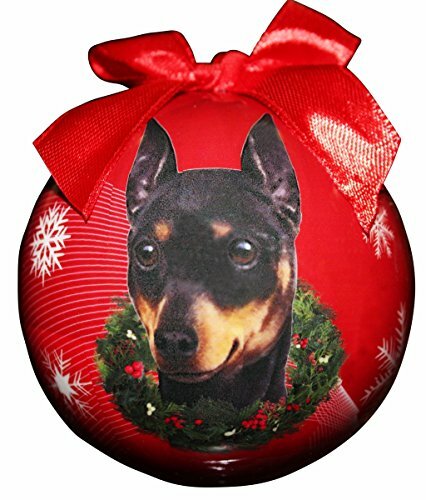 Each and every Miniature Pinscher Christmas ball is designed to perfection with a realistic hand crafted picture of your favorite pets. 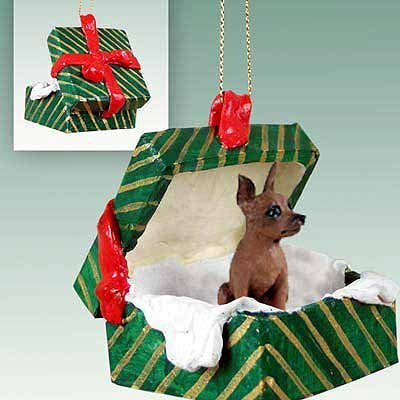 We are currently the only company manufacturing these shatter proof Miniature Pinscher Christmas ball ornaments and can guarantee it'll be the best and most durable Christmas item in your home for years to come. These ornaments are also easy to personalize with a sharpie, adding that do it yourself feel for that extra special touch! These are also great for gift giving. 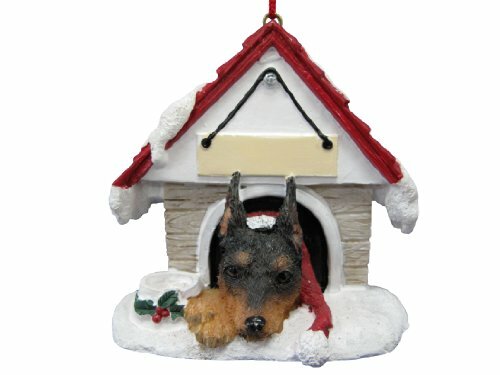 Each ornament comes packaged in a Christmas decorated box surrounded by Christmas sayings with each Miniature Pinschers face showing through the front like a picture frame. Shatter proof Christmas ball ornaments are irresistible at this great price and quality. 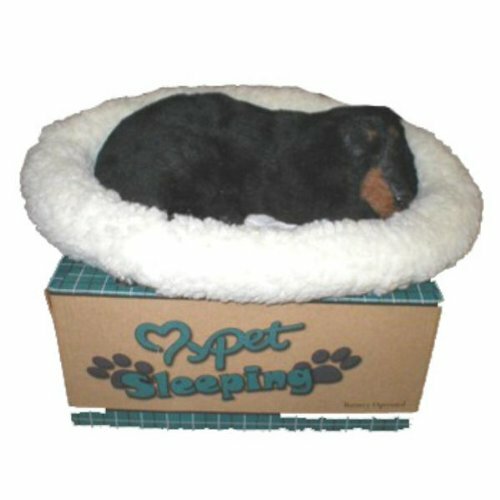 Battery operated(size D battery not included), comes with fleece bed and gift box. This life like Min Pin is made of 100% synthetic fur. It requires 1 size D battery not included. Simply switch it on and watch the chest cavity move up and down. Comes with fleece bed and cardboard carry case."" Sold Individually Please note: If there is a color/size/type option, the option closest to the image will be shipped (Or you may receive a random color/size/type). Copyright © Wholesalion.com 2019 - The Best Prices On Miniature Pinscher Ornament Online.